I kind of picture her waking up in the morning, doing the Bewitched nose wiggle and miraculously looking flawless. Speaking of the Bewitched magic nose wiggle, can anyone do that? I remember trying my damnedest as a child and never managing to get my nose to do that. *puts eyes back in head* woah! She is amazing! I love the first and last pictures. And the little sailor outfit is adorable. She’s gorgeous. I’m kind of glad she left Marilyn Manson. One of the few people I know (not that I know her) that make me want to embrace pale vs tan. She is always so luminous! i WISH i could wiggle my nose sooo much! She can do no wrong! Oh yeah. One of my fav diva is Dita! She’s beautifu, gorge and unique! Hi, love DITa too. Stopped by to leave a kiss. Dita is a goddess. She’s has he most perfect pale skin ever. oh, and luv, thanks for tagging me! it’s been incredibly busy around here, so i haven’t had the time to sit down and answer it. but will do so now! Dita is always so classy looking! 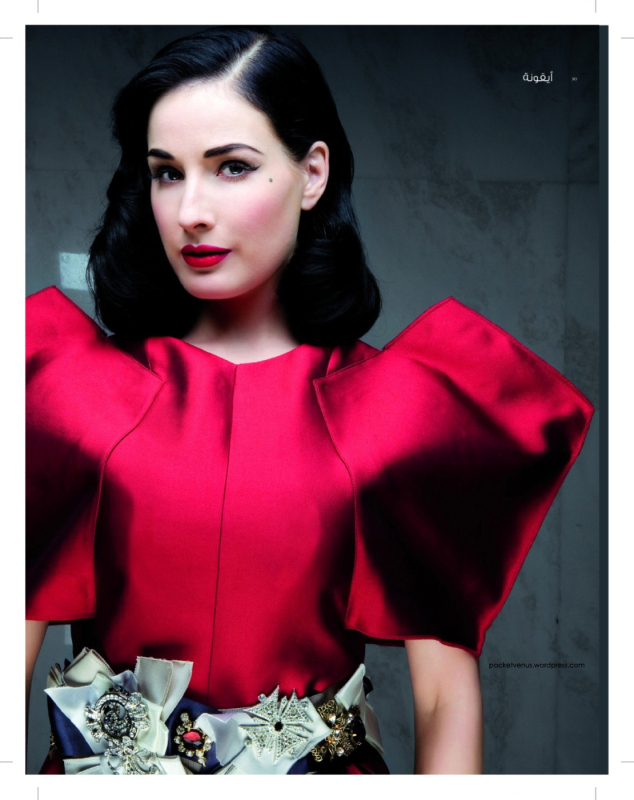 I don’t like Dita, but I’ve to admit, these photo’s are awesome. woah she is a babe!! and I know what you mean, carnies are so scary!!! once a year is good enough for me too. Wowser, I so love her shape, and the shapes that she creates with those curves! The styling is genuis too- it only enhances the beauty of her form! Ps listening to her speak is a really disappointment!